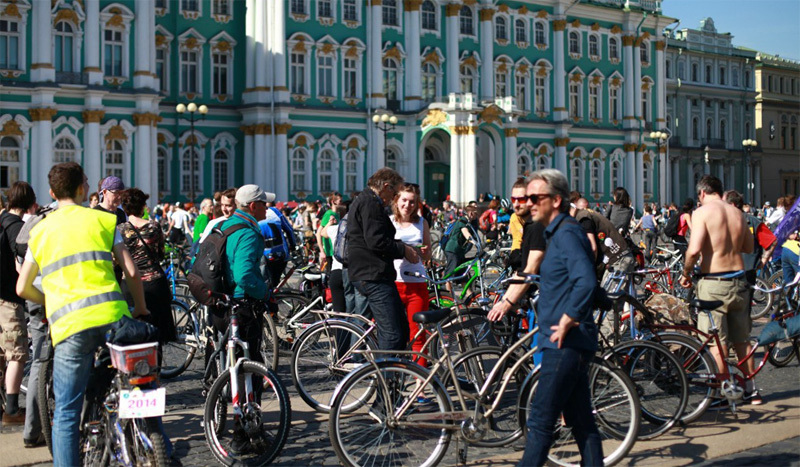 Saint Petersburg in Russia will host an International Cycling Conference on the 15th and 16th of May next. The conference is titled “Urban Sustainable Traffic and the Use of Bicycles” and it aims to be a platform where international experts in the field of urban mobility and bicycle infrastructure can meet and inspire representatives of Russian regions who are engaged in the development of cycling infrastructure. The conference would like to offer these representatives a possibility to study the international experiences and best practice to assess the possible application in Russia as a whole and in Saint Petersburg in particular. The cycle tour to close the 2014 conference. This is the second edition of the conference. Last year’s conference was called very successful and brought together experts from Denmark, the Netherlands, the United Kingdom, Germany and Finland. The Russian representatives came from Saint Petersburg, Moscow, Perm, Yekaterinburg, Novosibirsk and Voronzh. A video was made and a brochure (in English) of several presentations can be found on the internet. For this second conference experts from at least The Netherlands and Germany have already committed, as well as representatives from the departments of infrastructure of cities like Moscow and Saint Petersburg. 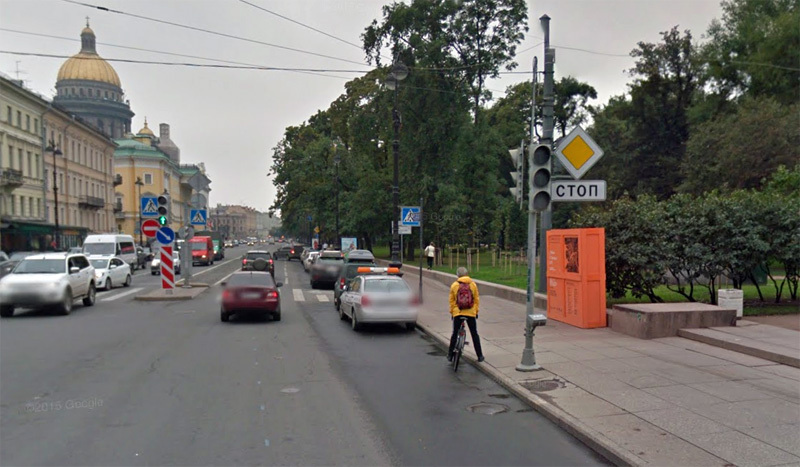 A brave cyclist in the steets of Saint Petersburg, captured by Google StreetView. The conference is organised by the non-governmental organisation “Velosipedization” of Saint Petersburg, with the support of the Friedrich Ebert Foundation (Germany’s oldest organisation to promote democracy, political education, and support students of outstanding intellectual abilities and personality). 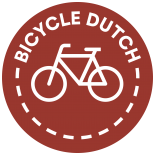 The organisation would like experts to give recommendations and share experiences that may make it possible for cities that could be considered ‘newcomers’ to start with the development of cycling infrastructure. My video “How the Dutch got their cycle paths” and other posts on my blog that explain how the Dutch made the transition from the much more car oriented society it was in the 1960s and 1970s to one where the bicycle plays an important role again, were reason for the organisation to ask me to participate. I have accepted the invitation and that means that I will visit Saint Petersburg and Russia for the first time in my life. In my presentation I hope to give the Russian representatives some background information about how the Dutch did and do things and why. This may help them to form ideas of what may also work in Russia. Rendering of a street in Yekatarinburg if it were to get Dutch style cycling infrastructure. A rendering by Vladimir Zlokazov of LiveStreets. You may have seen that I recently published a page in Russian on my blog. This is a page where all my videos that have Russian subtitles were brought together. This page gives an overview of my work and the selected videos give Russian visitors a good idea of best practice in The Netherlands in their own language. The text for the page and some of the Russian subtitles were made by Vladimir Zlokazov from Yekatarinburg. Vladimir has his own website (also partly in English) and he makes the most fantastic renderings that are almost like pictures. 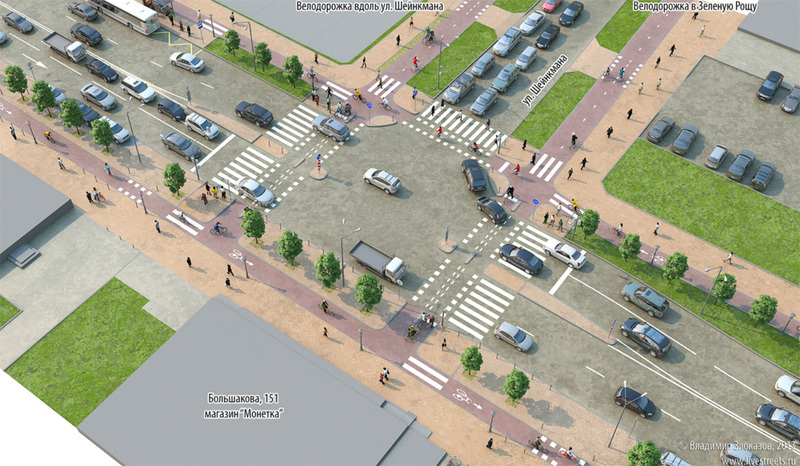 These renderings show Dutch style cycling infrastructure in a Russian setting. So we already know it is possible. Now all we have to do is convince the Russian decision makers! 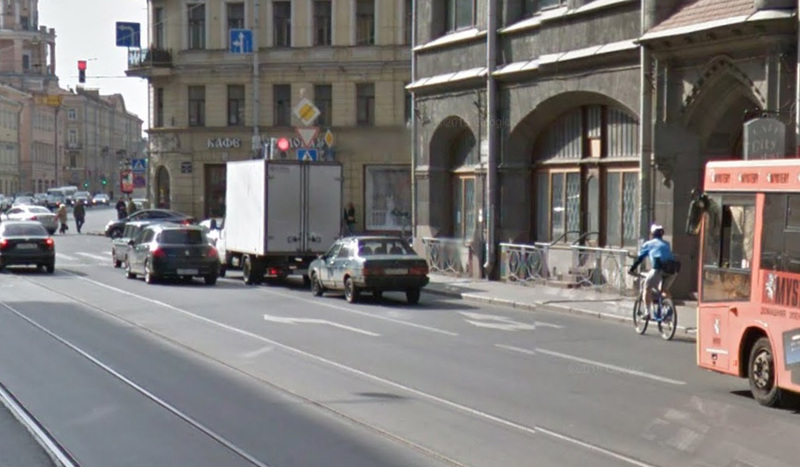 The streets of Saint Petersburg do not look very inviting for cycling today. Picture from Google StreetView. I am very much looking forward to this conference and I will of course report how it went on this blog. The conference programme in Russian (and in English via Bing Translate). It probably would have helped if a person could get a car as fast as a Soviet citizen usually could. I love my photo of me at the top. Apparently, the UK supplied some experts for last year’s conference. They would have got their expertise from where, exactly. Certainly not in the UK. Must be among the easiest jobs in the UK, no funding, no expectation of result. Oh, so cynical, but I have a smile on my face, an ironical one. Coincidentally having visited both St. Petersburg and Yekaterinburg in the last two years, I can say that I don’t remember having seen any cycling infrastructure. Also the streets feel pretty hostile (even as a pedestrian), more so than the US and UK: wide, multi-lane streets with fast moving traffic, not always observing speed limits. The very little cycling I’ve seen there was mostly on pavements. At least there seems to sufficient space to add cycling infra. The renderings by Vladimir Zlokazov look great to me and would be huge improvements. Good luck with with the challenge of convincing the local governments to implement this! Hey Mark, might want to bring your video about winter cycling to Russia, for everybody knows Canada and Russia are two very winter countries, and you are visiting the latter. Russia could use a cycling advocate like you. A cyclist or pedestrian in the cities especially of Russia (believe it or not, my maternal grandmother was born in Russia, or was it my maternal great grandmother?) is either brave or stupid. I hope they are the brave type who can at least do their best to avoid death or injury. Maybe a human powered T-90 tank will help? This entry was posted on 3 May 2015 by Bicycle Dutch in Original posts and tagged bicycle culture, campaigning, Russia, Saint Petersburg.